JAM Project (“JAM” standing for “Japan Animation-song Makers”) is an anime music (or anisong) supergroup based in Japan, labbelled under Lantis. JAM Project is originally founded on July 19, 2000 by famous 1970s theme song artist Ichirou Mizuki. The group is composed of many vocal artists well known in the industry; aside from the many anime, tokusatsu, and video game theme songs that this group has performed together, each member is famous for his or her own solo performances of Japanese theme songs. 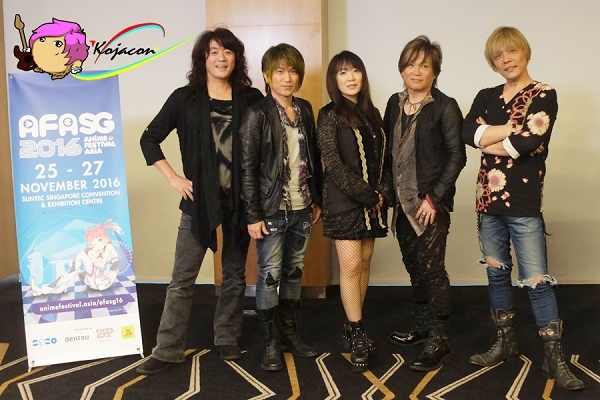 JAM Project especially well known for their extensive contributions of theme music for Super Robot Wars and Garo. In the summer of 2012, they teamed up with Animetal USA for a limited national concert tour called the Japan-America Anison Summit. From 2011 to 2014, Japanese composer and conductor Takayuki Hattori served as orchestral arranger on several albums and tours. JAM Project consists of five regular members, Hironobu Kageyama – founding member, Masaaki Endou – founding member, Hiroshi Kitadani – joined in June 2002, Masami Okui – joined in March 2003, and Yoshiki Fukuyama – joined in March 2003. Their former members are Eizou Sakamoto – founding member; stopped activity with the group in March 2003 prior to Fukuyama and Okui’s joining, referring to it as “Graduation”, Rica Matsumoto – founding member; announced on April 7, 2008, that she was taking time off from the band to focus on her solo work, since becoming an indefinite hiatus. She returned briefly in 2010 to help write the 10th anniversary version of Kizuna on MAXIMIZER, and Ichirou Mizuki – founding member; formally reduced his status to “part-time member” in August 2002, following the group’s second live concert. Beside that, JAM Project also has a semi-regular member Ricardo Cruz – additional vocalist from Brazil; heard on the songs “Neppu! Shippu! Cybaster” (2005 version), “Gong”, “Stormbringer”, “Rescue Fire”, “The Guardian”, “Transformers Evo.”, “Sempre Sonhando”, “Waga Na wa Garo”, “Mirai e no Chikai”, “Mirai e no Daikoukai ~Great voyage~”, “BUDDY IN SOUL”, and “Treasure in the sky”. In this occasion, Kojacon Team got the opportunity to have an interview with JAM Project. They share us the stories of their latest singles and live tour, also we talked about random thoughts. Welcome back to Singapore! How do you feel about your 2nd time here? And for Kitadani-san, it’s your 3rd time here, any other comments? Kitadani: Thanks for your warm welcome. Finally we return here again. Last year we were coming in Lantis Festival and for previous AFA, I came alone. So it’s wonderful we could come to perform in AFA together as full team, we will show you all the great performance experience as we perform in Japan. We’re looking forward to meet you all at tonight’s show. Kageyama: You know the Japanese dorama which just started on the beginning of November, Yuusha Yoshihiko, we sing the opening song for that dorama. This time is our first time to sing it overseas, we’re very excited about that, so don’t miss it! Congratulations for your Asia Tour! Is there any memorable moments at your latest live tour? Kageyama: Oh yes, that was our very first time went to Middle East country. We had a performance in Abu Dhabi! What a great experence, I think. We learned new different culture there and surprisingly the audience just as hype as the other countries. We’re vey happy to meet fans on the other part of this world. Have achieved so many success points in JAM Project’s music career, is there anything else you want to get within 5 years? Furthermore, JAM Project already performed in Budoukan, a place where all Japanese artist dream about and done many overseas live, do you have any future goals? Fukuyama: Of course health! LOL Since we’re the most veteran anisong group in Japan, I think health matter is number one! So we can continue our journey to another 5 years or more. Kageyama: Yeah maybe we’d like to go to another country which we never visited before. You know, I ever heard that a lot of Japanese event are held in Africa. Hope we got the opportunity to go there and perform our anisong! Until now, JAM Project already sing for a lot of sountracks for anime series, is there any other anime you want to sing for? Okui: Gundam. This anime has a lot of series, and everyone from all over the world would know Gundam, right? Beside that I think One piece is also great! One Punch Man gained a popularity in Japan and overseas, could you tell us your impression about your song “The Hero” which became the soundtrack for that anime. Kitadani: That’s true, last year when we have world tour, we always sing that song in overseas live. We’re so touched yet very happy that all fans, especially in France and US know One Punch Man anime so well and indeed they know our song. Audience were singing together with us, and that gave us more power to perform, thank you so much! How about your latest soundtrack for Dorama Yuusha Yoshihiko titled “The Brave”? Is there any thoughts related to this song? Kageyama: Yes, what to say. This is our newest tie-up song, neither for anime nor for tokusatsu like usual. The main role character’s cast Takayuki Yamada said that he is a big fans of Dragon Ball when he was young, then he asked us whether JAM Project could sing any soundtrack of his new dorama? I think it’s so surprising. But we did it anyway, and we’re very happy to be a part of this project! Please share in advance the highlights of your 20th Anniversary single “The Exceeder”, soundtrack for Super Robot Wars V? Kageyama: For the song itself, maybe if we compare to another songs of us, this one is an easy-listening song and this song is easier to understand for non-japanese speaker as well. Also, it’s a very nostalgic songs, and I think they said they will localize this song into each language of country which release the game. Between all JAM Project songs, which song has the biggest meaning for each member? Okui: SKILL! Sorry for answering the same with Endou-san but it’s okay right? LOL. Actually this is my first recorded song as JAM Project member, I feel so touched and this song is very memorable for me, until now. Kageyama: I choose Hagane no Messiah, soundtrack for Super Robot Wars Alpha Gaiden. Because this is our first time recording a song together, so this song is just like our root and for me root is very important. Kitadani: Rescue Fire, soundtrack for Tomica Hero. You know this song is very exciting and I’m happy to sing this song while everyone also get excited at the show. This passionate song always get good response to audience! Fukuyama: Honestly speaking I want to answer “SKILL” too, but since Endou-san and Okui-san already answered that, so I’ll choose THE HERO! ~Ikareru Kobushi ni Honoo wo Tsukero~, soundtrack for One Punch Man. Yes I know this is our recent song, but this is song is very popular and I always see cosplayers of One Punch Man at every live venue. I know everyone could sing this song together with us. What do you want to do actually before ended up as anisong singer in JAM Project? Do you have experienced something unique before? Kageyama: My family open a barber shop, and I supposed to be worked there also. Actually. If I’m not joining JAM Project now. I think I should become a hair stylish. But it never happened since I was 16 at my first debut. Kitadani: I want to be a professional baseball player! I like to play baseball from Junior High School, and it’s ever child dream to become a baseball player, right? But anyway I’d like to sing though and I ever joined a band in high school, so whichever is okay for me. Okui: Since my early childhood, I always dream to be an artist or singer! So the dream comes true! Fukuyama: I want to be a normal person. Like what? Salaryman? It’s okay. But frankly speaking when I was still a little kid, I want to be a painter or architect. I also like to draw manga, I want to make a 4-koma manga if I have a time!